Apple today announced financial results for the third calendar quarter and fourth fiscal quarter of 2014. For the quarter, Apple posted revenue of $42.1 billion and net quarterly profit of $8.5 billion, or $1.42 per diluted share, compared to revenue of $37.5 billion and net quarterly profit of $7.5 billion, or $1.01 per diluted share in the year-ago quarter. Gross margin for the quarter was 38 percent compared to 37 percent in the year-ago quarter, with international sales accounting for 60 percent of revenue. Apple also declared an upcoming dividend payment of $0.47 per share, payable on November 13 to shareholders of record as of November 10. The company currently holds $155.2 billion in cash and marketable securities. For the full fiscal year, Apple generated $182.8 billion in sales, a new record for the firm, with $38.5 billion in net income. In fiscal 2013, Apple made $35 billion on $170.9 billion in sales. In 2014, Apple sold 18.9 million Macs and just shy of 14.4 million iPods, its lowest total for that category since 2004. It sold a record 169.2 million iPhones on the year, up 150 million from 2012, and the company has now sold more than 590 million smartphones in total. It sold 68 million iPads in 2014 and the company has now sold 237.2 million tablets. Apple's guidance for the first quarter of fiscal 2015 includes expected revenue of $63.5-66.5 billion and gross margin between 37.5 and 38.5 percent. Apple will provide live streaming of its fiscal Q4 2014 financial results conference call at 2:00 PM Pacific, and MacRumors will update this story with coverage of the conference call highlights. 3:02 pm: The call is now concluded. 3:02 pm: A: For iPhone I have it by model from June quarter. As I mentioned before, the highest percentage is the 4s buyer in China, over 80% were buying first iPhone. For 5s in China, 50% were. I think what that says, those numbers are so high, 50-80, my gut tells me a great percentage of 6 and 6 Plus buyers will be new to iPhone. 3:01 pm: Q: 50-70% in top six countries were new buyers, wondered if you could give that same range for iPhones? Broadly speaking, how does that number change your guess as you look over the next couple quarters? 3:00 pm: Strength of a market, I look at unit sell-through. To share with you, Greater China, unit sell through despite no launch was up 32% year over year. Market was projected by IDC to only grow 13%. Incredibly great about that. Macs were up 54% year over year. That is against the IDC estimate of market contraction in China of 7%. Those are our two stalwarts that are really driving results. Underlying results look different from reported results because of channel inventory kind of differences. App Store doing great, growth there is phenomenal, iPad contracted some during the quarter but for the year we did grow, up 9% year over year for full year. I see lots of positives, as you know China is on early stages of 4G rollout, this weekend we launched it with China Mobile, China Unicom and China Telecom. First time we've launched new iPhone with all three carriers and done at early stages of 4G rollout. Subsidies, regulatory pressures on subsidies, we've seen that. However, only 20% of iPhones that we've been selling in china have had a traditional subsidy applied to it. Vast majority don't. Will it make a difference with that 20%? I don't know yet. Intuitively, you'd think it would but it's at least a percentage of a 20% instead of a percentage of 100%. When I look at China, I see an enormous market where there are more people graduating into the middle class than any nation on earth in history. Incredible market where people want the latest technology and products that we're providing. We're investing like crazy in the market, we're more than doubling our stors. Will be close to 40 stores, now covering 350 cities on online store. Revenue more than double the previous year. Chinese developers have created 150,000 apps on App Store. I see lots of very positive vectors there and I couldn't be more excited. 2:57 pm: A: Look at Greater China Q4 of 2014 vs 2013, obvious difference is we launched 5s in Q4 of 13 and this year we didn't have new product launch, launching in Q1 of 15. Second thing that's not as apparent, last year we increased channel inventory by 1.3 million. This year we decreased it slightly. Compounded effect of no launch and a huge change in channel inventory on YoY basis. 2:56 pm: Q: China? Numbers weren't as good as the rest of the company this quarter, presumable the iPhone. Last few weeks, and December quarter? Related to political backdrop including carriers mandated not to spend same level of subsidies. Any of that impacting your opportunities broadly and specifically for iPhones as it relates to subsidy levels? 2:55 pm: A: You know what our product cadence is. Holiday season is a period where we have significant product events. We're not providing any guidance for March, keep in mind if you're trying to extrapolate into the future, there are so many factors that affect Gross Margin, transition costs, product mix, foreign exchange, commodity markets. 2:55 pm: Q: Typical transition costs with new products you're rolling out, do those start to ease in the March quarter, and would that have a positive impact on margin in March vs December. 2:54 pm: A: For Apple as an investor, I would hope that people would look at what we've done and what we've delivered. Power and strength of product line that we've announced and maybe more importantly than all the stuff you can see, look at the skills in the company. Only company on the planet that has ability to integrate hardware and software at a world class level. That allow Apple to play in so many areas. Which one to say no to and which to say yes to? One of focus. Not ones of "do we have any great ideas?" Always have more ideas than resources to deal with. I would look at that. Look at what we talked bout last week. Continuity. Use your imagination and think about where that goes, no other company can do this. Apple's the only one. For customers living in an environment where they're using multiple devices, skills, capabilities, passion of the company, creative engine has never been stronger. You can see that, Apple Watch, Apple Pay, Apple Pay is classic Apple, taking something that is incredibly old, outdated, klugey, everybody focused on everything else, we're focused on making something very elegant. Look at those things, as an investor I feel great. As a personal investor I feel great. 2:52 pm: Q: In terms of last year, had high expectations. Think about Apple as product cycle story. How do you think about the story broadly in 2015? 2:52 pm: A: Incredibly optimistic about the future. Announced two new categories in last 60 days with Apple Pay and Apple Watch. Obviously working on other things as well, to the degree that I can keep that in the cone of silence, I'm going to do it. Not sure what to say. Not going to give any hints or anything, we look at a lot of different things. Lot of creative people here that want to change the world and have a lot of great ideas. 2:51 pm: Q: You put out a lot of products, everybody gives credit for great new products. Everybody talks about what's next. You said recently that you're working on products that people didn't even speculate on yet, that's pretty hard with Apple given how many people watch your company and watch it. Elaborate on that in terms of your excitement about new products. How do you feel about the future? 2:50 pm: A: Said nothing about expectation for product, didn't form based on expectations. Looked at current revenue and decided that would lump everything that wasn't a Mac or iPad or Service or iPhone in one category. In future, might decide different. For now, in Q1, we're not shipping Apple Watches. So it seems appropriate to start it that way. Also, to be also straight, I'm not very anxious to report a lot of numbers on Apple Watch and giving a lot of detail on it. Our competitors are looking for it. Aggregating it is helpful from that point of view as well. 2:49 pm: Q: What should we make out with new segments, with Apple Watch in the other category. Seems like such substantial new category, could maybe sell tens of millions of units. Lumped in other with iPods and other things, does that say something about your expectations for that product? Do you think you'll break it out after a little while. 2:48 pm: Judge it as you will. 2:48 pm: More important than selling is changing the way people work. Catalysts going forward, obvious cannibalization things that are occurring. Some people look at Mac and iPad and decided on Mac. Don't have research to demonstrate that but I'm sure of that looking at the numbers. I'm fine with that. Some will look at iPhone and iPad and decide to get an iPhone. I'm fine with that. Over long arc of time, iPad has a great future. How individual 90 day clicks work out, I don't know. Very bullish on where we can take iPad over time and so we're continuing to invest in the product pipeline, continuing to invest in distribution. Look at how we did in emerging markets and BRIC countries, up 20% for full year of 2014. These numbers are impressive, BRIC countries are growing as a percentage of our total as are developing markets. Looks different geography to geography. 2:47 pm: People always respond for us doing great products and we feel really great about what we introduced last week. The deeper the apps go in the Enterprise, the more it opens up avenues in Enterprise. That's a key part of the IBM partnership. 2:46 pm: Real data: Top 6 revenue countries, in country that sold the lowest percentage of iPads to people who had never bought an iPad before, that number is 50%. Range goes from 50-70. When I look at first-time buyer rate in that area, saturated... that's not a saturated market. Never have first time buyer rates at 50-70%. People hold on to their iPads longer than they do a phone. Because we've only been in this business four years, we don't know what upgrade cycle will be for people. Difficult thing to call. 2:45 pm: For iPad, if I take a step back on iPad, I know that there's a lot of negative commentary in the markets on this, I have a little different perspective on it. If you step back, we've sold 240 million in 4 years. Twice the number of iPhones we sold. in Fiscal 13 we sold 71 million, but only down 4% on sell-in, took down channel inventory so sell through is a little better. Speed bump, not a huge issue. That said, we want to grow. We don't like negative numbers. So, looking further in the data, I know there's a popular view that the market is saturated. We don't see that. I look at our data deeply and the last market research data is from June quarter. 2:44 pm: A: Mac, just a blow-away quarter. Our best ever, it will result in our highest market share since 1995. Stunning. Back to school season voted and Mac won, carried the day. Really proud of that, proud of the Mac team. Clear that all the work that we've put into our notebooks on the hardware and software side is resonating with our customers. Go out to college campuses, you'd see a lot of Mac notebooks. Feels fantastic, up 21% in a market that's shrinking, it doesn't get better than that. 2:43 pm: Q: Strength in Mac, weakness in iPad. What's the message? Does that affect your view of doing a convertible type product? Very focused products but maybe something in between that can be successful. 2:42 pm: A: Not a lot of color I can give that is terribly accurate, so we're selling everything we make. Our current sell-through is our current supply. In long arc of time, once there's enough supply to meet demand, that mix might look differently. It is clear, I think, that we will see a difference by geography in terms of preference. We thought that going into launch. No data would suggest that that isn't the case. That's about all I can say at this point. 2:42 pm: Q: Is there more color you can give us to the mix of the iPhone to 6 to 6 Plus? We see 2.5:1 in the US, is there any color you can give us? 2:41 pm: The way I look at those, on a forward basis, what I would expect (though we don't give guidance on this kind of stuff), I see a fairly large opportunity in people buying their first iPhone ever. This opportunity increases not decreases with iPhone 6. Upgrade market for people that were waiting for iPhone 6 or 6 Plus as we can see from our order backlog, that number is huge. I would expect that to go on for some period of time because you have people that time out of contracts at different time. Not everybody does that at launch. I see both the first time buyer being a great opportunity, and the upgrade... some of the first time buyers are people who have never had a smartphone and some are switchers from Android. Right now all of those look very good to us but we're in the early going and we're selling everything we're making. It's going to take some period of time before we have a better handle on what those numbers will look like. Never felt so great after a launch before. Maybe that's the best way to summarize it. 2:39 pm: A: Difficult to answer. If you look at some of our top countries, and how they did in mid-year of selling a customer the first iPhone they'd ever bought, you'd see in countries like China, over 80% of people we were selling 4s to were buying first iPhone ever. In US, it was over 60%. Those kind of give you goalposts of large countries in terms of first time ownership at our entry level. Step across and look at 5s, that time the top-end phone, in China, still almost half were buying their first iPhone. A quarter of the US population buying a 5s were the first ones. 2:38 pm: Q: Qualitatively, could you help us understand what you think the mix of repeat buyers is for iPhone 6 over next year vs first-time iPhone customers? Question in that is, do you believe that because the iPhone is so compelling that the traditional replacement cycle might be accelerated? If that's ultimately the case, do you in the future run reversion back to elongating back to that replacement cycle in future generations? 2:37 pm: A: On sequential basis ASP for iPhone was up $42, reason for increase was higher mix of new iPhone 6 and 6 Plus. Partial offset in quarter from transition costs that we incurred when we move to a new product. Going forward, obviously the percentage of new iPhone 6 and 6 Plus will increase sequentially as we get full quarter available to us. Correct that iPhone 6 Plus is supply constrained. 2:36 pm: Q: Pretty robust sequential increase in ASP on the iPhone. Understand if that was higher mix of new phones than you typically see in September quarter or was it really a function of the new phones having a richer ASP? If we look forward to fiscal Q1, last year had a substantial ASP increase. Should we be expecting a similar increase this quarter given widespread belief that availability on the 6 Plus has been more constrained and we could see higher percentage of 6 Plus next quarter? 2:35 pm: At this point, we're selling everything we make. It's difficult to say that we've estimated well on the SKU mix between the 6 and the 6 Plus. From everything we can tell, we've done a pretty good job on that. But, I stop short of saying there's no issue at all. It's hard to tell when you're at a point where you're selling everything you're making -- it's a good problem to have. 2:34 pm: We price our products in a way that is in general reflective of pricing here in the US and its a pricing that we want to keep in place for a reasonable period of time. Do not like to make sudden changes to our pricing. 2:34 pm: A: I said that the headwinds from FX are gonna be significant. I would tell you that they're most significant when you look at YoY than from sequential. Dollar has been strengthening for quite a while especially vs Yen or Canadian Dollar. It's a significant headwind and that's why we wanted to call it out. 2:33 pm: Q: Quantify currency headwinds on gross margin? A big focus on currency across tech. Should we expect price harmonization if the dollar remains strong? 2:33 pm: Very unusual to see every country having a marked improvement over the previous year and that's what we're seeing on iPhone. Couldn't be happier with how demand looks. Nancy's comment says we do not envision getting into extra inventory into the channel that we believe is needed when you think about the long food chains in these emerging markets. Distribution channels are not as efficient. That's the purpose of that comment. 2:32 pm: A: Ramp itself is going great. Fastest ever in our history. Couldn't be happier with it. That said, Today, demand is far outstripping supply. Unclear looking at the data when supply will catch up with demand. Don't want to leave you with a view that we know that we're going to get to a balance on both new products this quarter .I don't know that at this point. Very difficult to gauge demand without first finding the balance. As of today, certainly as of the end of the quarter, we're not nearly balanced. Not close. Not on the same planet. That said, I'm really confident the supply is going to be great, and that's why you see incredibly strong guidance from $63.5 to $66.5. Very difficult to gauge true demand. 2:30 pm: Q: Current supply constraints for iPhone, you'll reach supply/demand balance by end of quarter? What are bottlenecks for supply on iPhone? 2:30 pm: A: Puts and takes of margin. On positive, we are pleased with launch of new phones. Demand is phenomenal. Favorable impact from iPhone mix. Also getting some leverage from the higher revenues that we guided to. Continue to see fairly favorable commodity environment. On negative, talked about FX. We launched a lot of new products and got transition costs as we move from current to new products. Tends to be a headwind. Every time we launch new products, we make them better .Cost structure tends to go up. Good track record of taking those cost structures down over time. Take positives and negatives, that is what the guidance that we just provided. 2:29 pm: Q: Could you comment on how we should think about GM outside of FX? It's still early but how should we think about gross margin in iPhone 6 family vs iPhone 5s. Is this a normal cycle in expected cost improvements? 2:28 pm: A: Hedging program and strength of dollar towards the end of the quarter didn't impact Q4. Is becoming a significant headwind in Q1 YoY and Sequential. We have reflected the new FX situation at current levels into our guidance for revenue and gross margin. A fact of life, if the US dollar strengthens, that creates a headwind for us in revenue and margin for business outside the US. We have a comprehensive hedging program in place that mitigates the impact of foreign exchange. These hedges get rolled off and replaced by new hedges, protection that you get is temporary. Guidance that we provided full reflects the current FX situation. 2:27 pm: Q: How did you determine margin including US Dollar exchange rates? 2:26 pm: Those are private. As Nancy was saying, We'll be reporting Apple Pay in the services line item on the data sheet. Incredible service that is the most customer centric. 2:26 pm: Ease of use, security and privacy. We will sell more devices because we think it's a killer feature. Better than reaching into pocketbook and find card that you're looking for. Do not charge the customer for the benefit. Do not charge the merchant for the benefit. Commercial terms between Apple and the issuing banks. We're not disclosing what they are. 2:25 pm: Wanted to focus on security and privacy. Huge issues with security of traditional credit card system. Many people that have entered mobile payments are doing so in a way that they want to monetize the data that they collect from the customers. We think that customers in general do not want this. They want to keep their data private. 2:24 pm: A: What we wanted to achieve was to have an incredible consumer experience. Focused very much on making it elegant and simple, hopefully your trials have proven that. I used it over the weekend and it worked fantastically. 2:24 pm: Q: Apple Pay, used this afternoon and where it was rolled out it worked pretty well. Provide color on business model on Apple Pay, is it over time becoming a standalone business like iTunes or more a way to sell incremental products? 2:23 pm: Size, complexity of our channels, 5-7 week average range for iPhone and iPad is more appropriate and that will be our target range going forward. Given backlog for new products, we expect to exit the December quarter in old 4-6 week target range. 2:23 pm: Distribution channels have evolved and expanded in last couple of years. Today iPhone is sold in 200,000 locations around the world. iPad sold in more than 100,000. Revenue from emerging markets has increased significantly. Channel inventory in those markets tend to be much longer. 2:22 pm: Also reclassify historical results to be consistent with these new groupings. 2:22 pm: Q1 2015: Product reporting categories: iPhone, iPad, Mac, Services, and Other Products. 2:22 pm: New Reporting Category called Other Products: Everything we report in Accessories category including Beats, Apple TV, peripherals and accessories, adding iPod and Apple Watch in this line item. 2:21 pm: Making changes to product summary reporting: Reporting iPhone, iPad and Mac as separate line items. Also a category that we refer to as services: Everything we report under iTunes, Software and Services, Licensing, Apps. Also include Apple Pay. 2:21 pm: Reporting changes: To better serve customers and optimize results, collaborating across direct and indirect channels. Beginning in Q1 2015, including results in retail stores in the geographic census where stores are located. Consistent with way executive team measures the business. Reportable segments: Americas, Europe, Greater China, Japan, Asia-Pacific. Retail no longer classified as a segment. 2:20 pm: Board declares dividend of $0.47. 2:20 pm: Outlook: Expect revenue to be between $63.5 and $66.5 billion, vs $57.6 billion year ago. Double-digit revenue increase despite significant foreign exchange headwinds. GM between 37.5 and 38.5%, OpEx between $5.4 and $5.5 billion. Tax rate to be 26.5%. 2:19 pm: Review capital allocation regularly. Solicited feedback in the past, will continue to do so. Will report on conclusion in time-frame similar to last year. 2:18 pm: $155.2 billion in cash and marketable securities. Down $9.3 billion. Executing capital return program, total spend of $20 billion in Sept quarter. Spent $9 billion in share repurchase, $8 billion in open market, $2.8 billion in dividends, $300 million for vesting employee RSU's. $94 billion of $130 billion capital return, $68 billion in share repurchases with five quarters remaining. 2:17 pm: Retail stores generated $5.1 billion, up 15% YoY, new September quarter record. 10 new stores, remodels of 3 stores. 437 stores, 41% of which are outside the U.S. Total of 25 new stores in 2015, three-quarters will be outside the US, plan to remodel 5 stores. Average revenue per store was $11.9 million vs $10.9 million year ago. 102 million visitors. 18,000 visitors per store per week. 2:17 pm: 22% growth in registered app developers, approaching 10 million. Strong interest in Enterprise, with developers up 30% YoY. 2:16 pm: iTunes Store recorded all-time record billings, up 22% year over year. Tremendous growth in App Store. 2:15 pm: Apple working with 50 companies to become foundation clients and become mobile-first companies in their industries. 2:14 pm: iPad, sold 12.3 million vs 14.1 million last year. Anticipation of new product announcement, reduced iPad channel inventory by 500,000 from end of June quarter. Left in target range of channel inventory on look-back basis. Strong results in Japan with iPad sales up 46% YoY. 2:14 pm: Gained market share for 33 of last 34 quarters. Mac inventory slightly below 4-5 week target range. 2:13 pm: Strong demand for portables, double digit mac growth across most markets. Strong performance in emerging markets with Mac sales up 40+ percent. 2:13 pm: 5.5 million Macs, up almost 1 million from last year. 21% growth from last year and an all-time quarterly record. 2:12 pm: Enterprise markets remains strong. IDC says iPhone has 69% share of US commercial smartphone market, also ChangeWave of corporate IT buyers, among those planning to purchase smartphones in December Quarter, 75% plan to purchase iPhones. 2:12 pm: Channel inventory up just 1 million units, less than 3.3 million unit increase from year ago. Very strong demand for new iPhones, below our target range of 4-6 weeks for channel inventory. 2:11 pm: 39.3 million iPhones, up 5.5 million from last year, 16% growth. Underlying demand was stronger with sell through growth of 26%. iPhone sales grew across developed and emerging market. US up 17%, Western Europe up 20%. Latin America and Middle East with sales up 50%, central and eastern Europe more than doubled. 2:11 pm: Generated record revenue, up 12% year over year. Results exceeded guidance range thanks to better than expected sales for iPhones and Macs across all segments. 38% gross margin at high end of guidance range. Operating was $11.2 billion, 25% of revenue. $8.5 billion in revenue, diluted EPS of $1.42. 20% YoY increase. Cash flow from operations was strong, $13.3 billion, a new Q4 record. 2:10 pm: Thank all of our customers, employees, developers and business partners for making 2014 our best year yet. Thank shareholders for their continued support. Excited about road ahead. 2:09 pm: Incredibly proud of all of our work to protect the environment, to improve working conditions. 2:09 pm: Substantial investments in Apple's future while returning cash to shareholders. Executed aggressively against share repurchase program, spending $17 billion in September quarter alone, $45 billion in last year. 2:09 pm: 20 acquisitions in 2014, 7 alone in September quarter. Wonderful plans coming for Beats that will be shared in the future. 2:08 pm: Partnership aims to redefine the way work gets done. Spark true mobile-led business change. 2:08 pm: Investing in developing markets where revenue approached $50 billion, up 16% and twice the rate of growth of the company overall. Landmark partnership with IBM. 2:07 pm: Big investments in our business and expanded global footprint. 437 retail stores. 2:07 pm: Record-breaking Fiscal 2014. Last 4 quarters, products and services have generated $183 billion in revenue, up $12 billion. 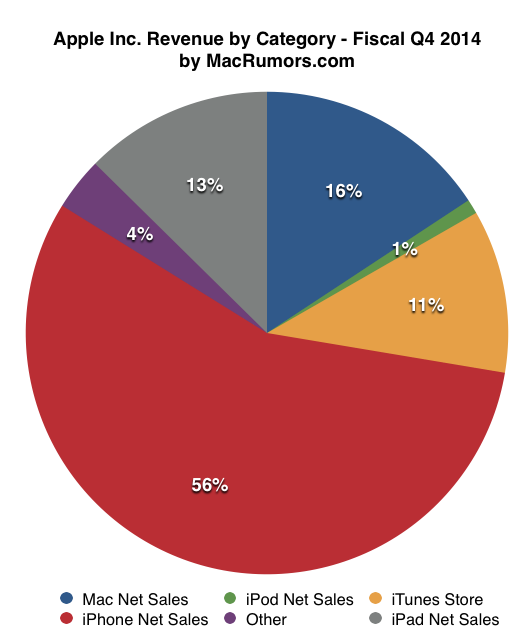 243 million iOS devices, 19 million Macs. Revenue from iTunes reached $18 billion, more than annual sales of 2/3 of companies in Fortune 500. $6.45 earnings per share, up 14% from last year, new record. 2:07 pm: Record for App Store. Grew 36% over last year, cumulative App downloads have topped 85 billion. 2:06 pm: Significant backlog for iPhone 6 and 6 Plus. 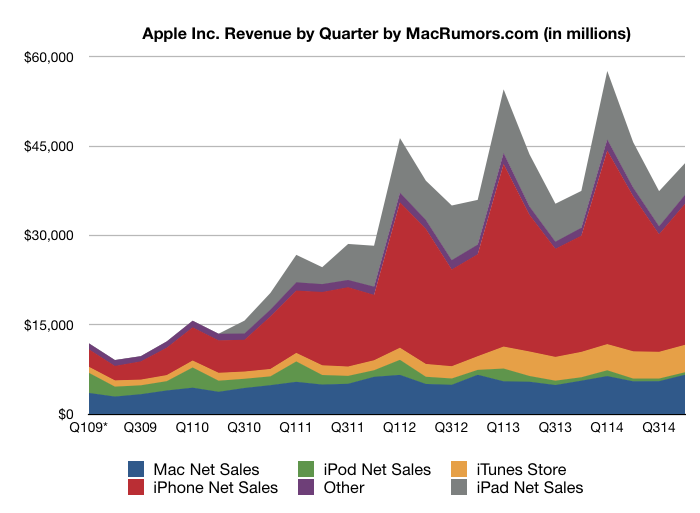 All-time quarterly Mac sales record, thanks in particular to strong performance of portables. Contraction of global PC market this year, highest quarterly market share since 1995. 2:06 pm: Strong demand for iPhone 6 and 6 Plus, and previous models, revenue growth of 21% year over year on iPhone in September. 26% growth in global unit sell through. 2:05 pm: Strong results for Apple's fourth fiscal corner. Growth far exceeded Apple's expectations. 2:05 pm: Strong encryption and strict policies that govern how data is handled. 2:05 pm: New product introductions represent years of work across multiple departments at Apple. 2:04 pm: Apple Watch coming in early calendar 2015, more details coming as we get closer to launch. 2:03 pm: On track to be in more than 115 countries by the end of December. 2:03 pm: iPhone demand is markedly higher in every single country. 2:03 pm: Tim Cook: "Exciting and very busy time. "Going over launch of recent products including iPhone. "Demand is staggering." 2:01 pm: The call is beginning now. 2:00 pm: The earnings call will begin momentarily. 1:42 pm: The earnings call will begin in approximately 20 minutes. Can "Samesung" sing the same song? NOPE! Apple made more money from Macs than iPads? Am I reading this right? * A new Mac Mini that's actually faster than the older one at lower prices, while eliminating one high-end config that nobody was buying. * A new iPad Mini that is basically last year's model with touch ID while cutting prices across the board. Yep, a truly exciting year! They could sell tons more Macs if they actually devoted as much effort to Mac development as much as they do for iPhones. Just sayin. Poor iPod sales. We had a good run. Just out of curiosity: Are you a shareholder? Pretty amazing. Never thought I would see that happen. I'm willing to bet the Apple halo effect is at play here and we are seeing the stickiness of iOS at work. Once you get any iOS device in your hand, you start investigating OSX and the ecosystem to a greater extent, which fuels Mac sales. * A new Mac Mini that's actually worse than the older one. * A "new" iPad Mini that is basically last year's model with a half-assed gold paintjob. * A new iPad Noob (where is the iPad Pro, Apple?). * The iPhone 6, which is actually nice, but marred by tons of quality control issues (call gate, bend gate, and so on). But hey, Apple has bought Beats! Now they have a woman beater on the staff! Surely that's a recipe for success!